While my work colleagues had filled their shortcut menus with work-related spreadsheets and testing tools, my computer had become a word gamer's arsenal, overflowing with crossword solvers, word finders, anagram generators, Scrabble helpers... you name it! Everything, that is, except the things that were supposed to be there. You can think of this page as a one-stop-shop for all the best word game helpers I've found over the years. I use many of them on a day-to-day basis to maintain this website. Well, actually, not all. On this page I've only included all the high-quality FREE Stuff! With each resource, I've added a little bit of chit chat to explain why it grabbed me. In some cases, I've put together a more extensive review or demonstration. When that happens, I'll be sure to give you the relevant link. 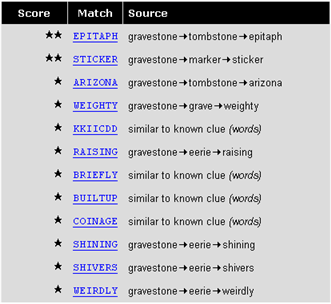 Again, these word game and word puzzle resources are completely free. 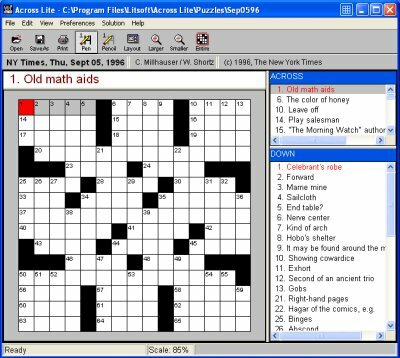 Across Lite is an application that allows you to view and solve crossword puzzles on your computer. It is the most popular choice for online crossword-solvers. Not only because it is so user-friendly, but also because it is absolutely FREE. You fill in entries by simply highlighting the relevant slot in the crossword grid, and typing letters on the keyboard. To speed up the process, when you select a clue in either the Across or Down panels, the relevant entry is automatically highlighted in the grid, and vice versa. Across Lite can be used to solve crossword puzzles distributed in a special format recognized by a .puz extension. It is so widely used in the crossword industry that you'll find most websites offering online puzzles distribute at least some of their puzzles in the .puz format. 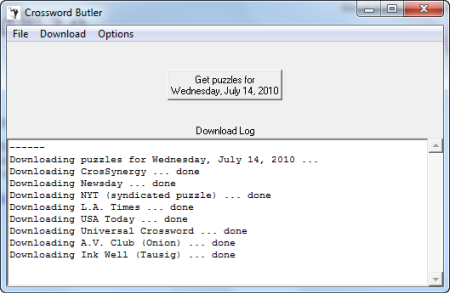 If you want to create crossword puzzles that others can solve using Across Lite, the online help has detailed instructions showing you how to format your puzzle as a text file, which can then be processed in Across Lite and output as a .puz file. NOTE Formatting a .puz file manually like this is a very tedious affair - the advantage being, of course, that it's free. If you are using the industry-standard Crossword Compiler to construct your puzzles, you can output to the .puz format automatically. What is a Chess Clock doing here on a page about word game helpers? Well, it doesn't really matter what it's called. In any timed game between two players (e.g. Scrabble) a special kind of clock is required that allows each player to start with a specified amount of time, and display the time they have remaining as the game progresses. 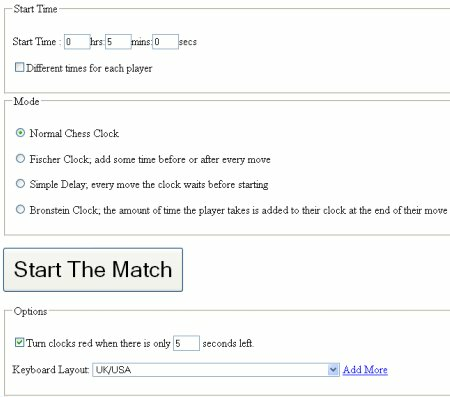 This requires a mechanism for each player to stop their clock at the end of their turn, and automatically start the opponent's clock simultaneously. You end your turn by clicking the panel displaying your remaining time, and this automatically triggers your opponent's timer to continue counting down. Because the program runs entirely within your browser (i.e. it doesn't use the internet), you can use the clock offline even when you don't have, or want, network access. To do this, you simply right-click on the main page and save the page to your computer. When you subsequently open that page from its saved location, the browser will open and run the program, but it will not attempt to access the internet. Like the idea? Well, you can access this very cool free chess clock here. 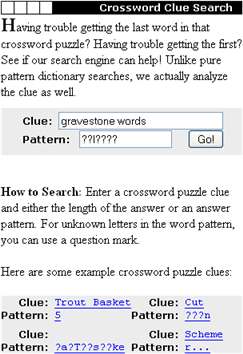 OneAcross is a very clever, and highly popular, online crossword puzzle solver. Quackle is an artificial intelligence and analysis tool that can be configured to play and critique Scrabble games. Quite simply, it is the best there is. And what's more, it is totally FREE. In the left hand panel you'll find most of the analysis tools. Here you can list all the possible plays available for a given move, and even get an estimate of the likelihood that each of those moves will win the game from the current position. I've written a bit more about this wonderful free Scrabble game here. But if you're itching for a game, you can download Quackle right now and start playing! Below is a very handy widget for resolving lounge-room Scrabble disputes over whether a word is valid. Just type your word in the space provided and click CHECK. After a short wait of a couple of seconds or so, a message will pop up saying either ALLOWED or NOT ALLOWED - dispute resolved! NOTE - This widget uses Collins Official Scrabble Dictionary , which is the word-authority everywhere in the world except North America. So if you want to play to the North American dictionary (which is a slightly smaller subset of the one above), you'll need to wait until I've tracked down a reliable widget for you. But it might well be quicker to just get yourself a physical copy of the Official Scrabble Players Dictionary . 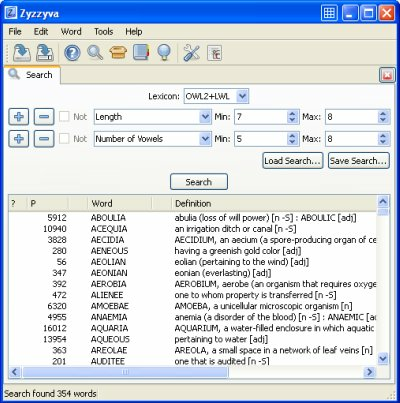 Zyzzyva is primarily a word-study tool for Scrabble players, although it can easily be adapted to other word games too (just by using a different dictionary). 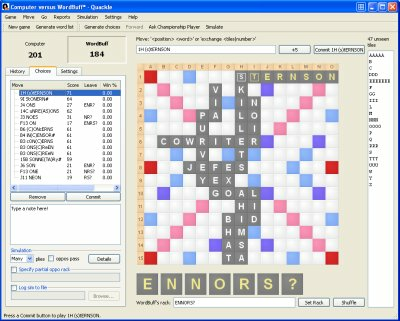 This very flexible Scrabble helper enables you to create just about any kind of word list you want, and it lets you quiz yourself and keep track of your performance on the particular set of words you've specified. It is also frequently used as the official word judge in Scrabble tournaments. Zyzzyva is currently the most popular product reviewed by Word-Buff. One of the reasons, no doubt, is that it is absolutely free! What Word Game Helpers Do YOU Use? Is there a word game helper application you swear by? Maybe a really cool word finder, anagram solver, crossword maker, spelling tutor, or some other great resource for word lovers? Just tell us the name of the tool you use and say a few words about what it does and why you like it so much. I'll publish your contribution on your own Web page, right here at Word-Buff! Your recommended tool will appear on a Web page exactly the way you enter it here. You can wrap a word in square brackets to make it appear bold. For example, [My Favorite Helper] would show as My Favorite Helper on your Web page.